Meghan wore a pair of earrings given to her by New Zealand's Prime Minister, Jacinda Ardern, when she and Harry visited the country on their first official tour as a married couple last year. Asked about his connection to Christchurch, Harry said: "It's just very sad." 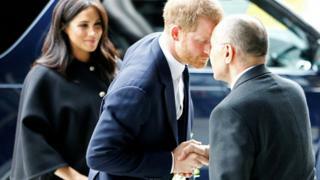 Meghan added she had been left "devastated" by the shootings. Sir Jerry said it was "wonderful" to host the royal guests. He added: "We are overwhelmed by the tremendous amount of support we've received from across the UK." They ended the message with the Maori words "Kia Kaha", meaning "stay strong". The Queen paid tribute to the emergency services and volunteers who helped the injured, saying: "Prince Philip and I send our condolences to the families and friends of those who have lost their lives." She added her "thoughts and prayers" were with "all New Zealanders" at this "tragic time".